Just got your hands on a Nokia Thermo? Get acquainted with the world’s first Wi-Fi connected thermometer, and learn how to make the most of all its features. Now that you’ve downloaded the Thermo app and set up your Thermo, you’re ready to learn how to make the most of your new smart thermometer. Thermo is able to deliver a highly accurate result with the use of our patented HotSpot Sensor Technology, which uses 16 infrared sensors to take more than 4,000 measurements in just 2 seconds. Taking a temperature reading is exceedingly simple. Once the scan is complete, the temperature reading will appear on Thermo’s screen. 1. Assign the temperature to a user by scrolling through names on the touch-sensitive screen. 2. Press the button to assign the reading. 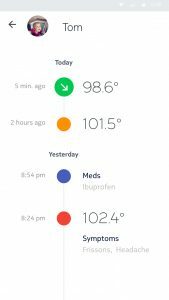 The Thermo app provides many additional features to help you manage a fever, including a fever timeline history and the ability to add notes to temperature readings, add medications taken, and set reminders to take your temperature. Thermo also provides in-app fever management advice through Thermia, a service developed by Boston Children’s Hospital. Simply answer a few additional questions in the app, and Thermia can tell you if your fever needs treatment and what dosage of medication you should take. That’s it! You’re ready to start using Thermo and enjoying all its unique benefits. Questions? Concerns? Our customer service team is here to help you out.